Portsmouth goalkeeper Asmir Begovic and Burnley midfielder Garreth O'Connor have left Bournemouth after both making nine appearances for them on loan. Canada Under-20 international Begovic, 20, began the season in goal after he was preferred to long-serving Cherries number one Neil Moss. However, he had recently lost his place in goal after Moss was recalled. 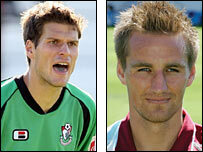 O'Connor, 28, who had previously played for the Cherries from 2000 to 2005, saw his second spell hampered by injuries. Meanwhile, striker Brett Pitman has learned that he did not fracture his foot against Bristol Rovers on Tuesday, but is almost certain to miss Sunday's game with Swansea, and may have a second X-ray on Monday.